First of all – apologies for not updating this blog for such a long time! I’ve had some major life changes (moved from Canada to New Zealand, pregnant with my 3rd baby, enrolled in a university course…) so it’s taken a while to find my footing again. Anyway, I was talking about financial priorities with a friend recently and we were debating whether there are any purchases worth going into debt for. My first instinct was NO, there is NOTHING. I don’t like debt as a general rule. Even if you are struggling to make ends meet, I really think that having adequate life and disability insurance is a MUST for someone who has a family. In my opinion, families should have life insurance coverage that would cover living and housing costs for 10 years at the very least. If you earn a lot of money, you should also consider how much money your family would be missing out on if you died or became disabled. For some professions, the disability portion maybe even more important to look into. For example, if you are say, a dentist, you need your hands to be functional to make a living, so even a minor accident can devastate you if you are no longer able to perform your job. Tip: The younger/healthier you are when you get it, the cheaper your premiums for a long time. If you live in a country like Canada, where there is universal health care coverage (i.e. paid for by the government), then additional health insurance is gravy – usually something that covers dental care, vision care, massages etc – and is something many employers provide. If you don’t get this extra health insurance, it’s not that big of a deal but still worth looking into. But if you live somewhere where the isn’t universal health care, like the US, please, please get health insurance. Put it as a priority even above life insurance. Put your monthly premiums on your credit card if you have to. Because medical bills are the #1 reason people go bankrupt in the US. Just one adverse medical problem can devastate a family overnight. And I’m not talking about a cancer or a major disease diagnosis, but normal life things like birth or accidents can end up costing hundreds of thousands of dollars. Unfortunately, even insurance is no guarantee that you won’t be faced with high deductibles or some out of pocket expenses, however hopefully the brunt of it will be taken care of by the insurance. If you live in a country that has a two-tier system, like New Zealand, I’d still consider getting additional health insurance especially after seeing the benefits of having it with a family member who was diagnosed with cancer recently. Divorce/separation is expensive – not just the actual cost of divorcing (legal fees etc), but the aftermath as well. Going from two incomes to one income to support pretty much the same sized family is tough (or having one income support double the living expenses). Not to mention the emotional cost and psychological cost that a divorce has on the children. As such, I highly recommend that couples seek counselling prior to officially separating and really trying to work on the issues the counsellor identifies. This may take more than one or two sessions so it is important to be patient. But you married/started a family with that person for a reason and it was likely very legitimate! Hopefully a bit of guidance can help you get back to the way you were. Even if you still choose to separate afterwards, I think that attempting counselling can be good for closure (you tried everything) and you may get tips on how best to go forward to minimize the negative effects on your family (which can have a huge effect on your financial situation). Counselling doesn’t have to cost a lot either – there may even be great free options at a church or community center. Of course there are certain situations where divorce is really the best option. But I believe only extreme cases warrant a divorce without an attempt at fixing what is broken. A mortgage is debt – make NO mistake about this. And it can be bad debt if you buy a house that you can’t afford. But it can also be good debt. Good if your mortgage (and other home-ownership costs) can be managed comfortably in your budget (see here for my recommendation on how much of your budget should be allocated to your housing costs). Good if you buy at a time when prices are on their way up (thus creating equity). And good if owning a home is an important life goal for you (it isn’t for everyone, so for those people, buying a home may NOT be the best idea) and you are at a point in your life where you are up for the responsibility. A car loan is debt. For some reason, I’ve met many people who seem to think that their car payment doesn’t count. Sorry, but yes, if you have an obligation to pay for your car – whether it is to the dealership, a family member or the bank, it is debt. And yes, a lease is debt too! However, in this day and age, having a car is pretty important – especially if they need it to get to work (and especially if public transportation options are not available, very limited or plain inconvenient). So I think going into debt to buy a car is usually totally acceptable. That said, I don’t think going into any amount of debt is justifiable – and I discuss how to determine what a reasonable amount for car ownership/lease is in greater detail here. There were some other things that I considered and things that I’ve seen mentioned on Facebook or whatever as worth going into debt for. Sorry, but going into a lot of debt to “create memories” is not a good reason. You can make memories with your family by organizing a great “stay-cation” and exploring your home town, choosing cheaper activities (camping vs going to a resort), cheaper travel methods (driving vs flying) and my favorite, SAVING for trips. These are the best way to really give your family experiences and creating memories because you will be doing so without the stress and burden of debt. In my mind, the only exception for going into debt for travel is for something like visiting a loved one who is sick or dying or perhaps attending a funeral. OMG – the Rolling Stones/[Insert your favorite band or singer] are coming to your city! Tickets are expensive but it’s their LAST TOUR. You HAVE TO GO. No, no you don’t. If you don’t have the money saved, don’t go into debt. Its not worth it. Unless you can squeeze it into your budget or take away from an unnecessary category (for example, taking from your vacation budget or forgoing going out for dinner for your next three date nights), then sure, go for it. But if you really don’t have the money to pay upfront for those tickets, it’s NOT justifiable. Recently I went to the jewellers to get a ring I have fixed. It had a design flaw and the stones on it were always loose – I even lost the centre stone one time (luckily found it) and I was worried it would happen again. I had avoided wearing it for fear of losing a stone again so when I noticed that the jewellery store had a policy where you can “upgrade” your jewellery by trading in your older piece for a new one, if the new one was more expensive, I decided to look into it. At first, this seemed like a great deal. Not only could I use the value of my ring as credit towards my new item, the manager at the store offered me a further discount. I’d be getting a way bigger stone ring, worth $3,500 and would ONLY be out of pocket $900. Except $900 is a lot of money. And even though we actually HAD the money was this really something worth doing? Did I NEED a more expensive ring? A ring that I didn’t even know existed until that day? No. I didn’t. Other than the opportunity to get a nice piece of jewellery for a great price (it really was a great price), there was no benefit. Especially when I did the math and realized I’d have to lose and replace the loose stone of my original ring like 6 times before I’d be out of pocket $900. This applies to everything – whether it’s a handbag you’ve been coveting, a great deal on an appliance or whatever, if you don’t have the money saved for it, it’s NOT WORTH going into debt for. Because at the end of the day, if you are paying interest on it, you aren’t *really* getting a deal. And remember, these deals come around again and again you will have plenty of opportunity to take advantage of them in the future. My advice? If you really, really, really want it, start making it a priority to save for it! In an effort to get healthier and lose some weight, my husband and I have really tried to cut way back on processed carbs, like bread, pasta, rice etc. We still eat carbs, just try to get them from whole foods more, like fruits and veggies and to be able to indulge in our favourite treats (for him, beer and for me, wine and chocolate). My husband has lost over 40 lbs and has kept it off for almost 6 months and counting! I was able to lose about 10 lbs and I’m finding it much easier to maintain so it has become our new lifestyle. 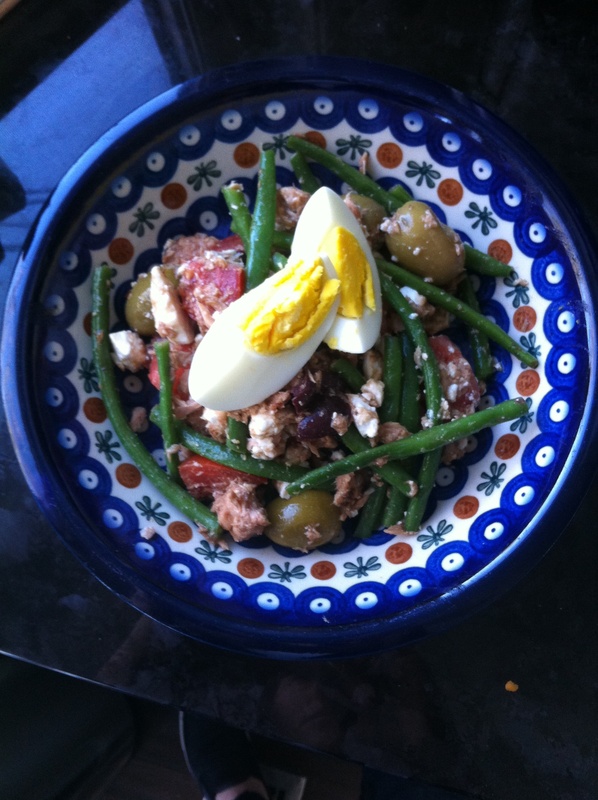 Tired of lettuce based salads I decided to do a take on the traditional Niçoise Salad. I love to make it for lunch for myself or even as a dinner for my husband and I (I just beef it up by adding an extra hard-boiled egg). 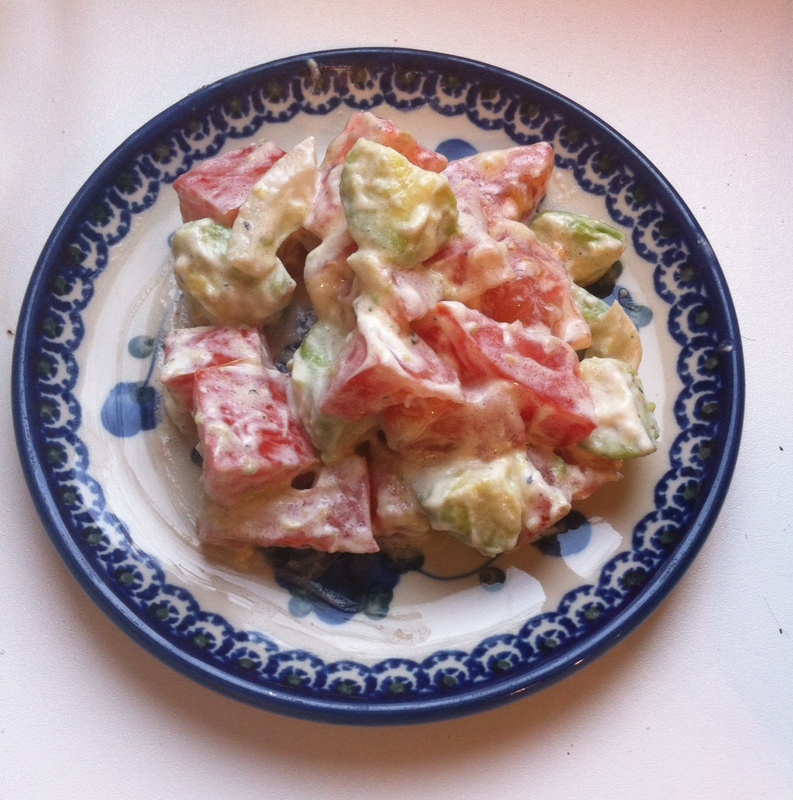 This salad also is delicious as a left over, so I will often make a double portion to keep for the next day. Wash and trim green beans. Cook by throwing into boiling water or steam for 2 or 3 minutes, so that they are still firm and crispy. Drain and place into a medium sized mixing bowl. Add chopped tomatoes, olives, can of tuna (I like pole and line caught tuna). Toss. Pour over olive oil and balsamic vinegar and season with salt and pepper, then toss again. Add crumbled feta and fold in gently. Plate the salad on to two plates and top with hard-boiled egg. I like to use a whole egg per person if I am serving this as a dinner and ½ an egg per person if serving it as a lunch. There are many benefits to owning your own business – you are the boss, your hours are more flexible (though on average, small business owner work more than regular employees) and you can often make more money. The reason you can make more money or at least, running your small business can be positive financially, is because of the things that you can expense (read: reduce your profit and pay less tax) through your business that you can also use outside of your business. However, some people take it too far and end up expensing way too much – and get caught with serious consequences. It can be exhilarating to know that as a small business owner you can legitimately expense things you need and use everyday anyway – things like your car, your cell phone and – if you work from home – even a portion of your mortgage interest. As these are things that you often need to run your business, they can be written off as a business expense. But some people cross the line from grey to black. One friend, a successful small business owner, admitted to me that he and his two business partners had a very good year and realized that their company will need to pay a lot of tax. So they decided to buy some extremely expensive designer suits (at a cost of $10,000 a pop!) and expense them as “uniforms” to reduce the total profit to bump them down into a lower tax bracket. Sounds like a great idea, right? Except that the tax authority caught on right away and not only did they have to pay the tax, they were slapped with a fine – and they weren’t able to return the suits! This is a trap that many small business owners fall for, and I think the worst offenders are people who run small businesses that are closer to hobbies or are part of a multi-level-marketing type business because they often don’t understand what is reasonable to expense and what isn’t. Here are some expensing tips to avoid being audited and potentially hit with major fines. Even if you don’t always or only use the items for your business, there are many expenses that we have that are considered reasonable to expense through a business. These are things that a person would reasonably use for their business. For example, if you are a physiotherapist that does house calls, expensing your car payments and gas is reasonable even if you also use that car for personal reasons. Bought a bunch of stamps that you mostly used to mail Christmas cards to your family and friends? That’s ok too as having postage is a reasonable thing for any business to need (even if you mostly communicate with your clients via email). Expensing flights to Hawaii as a travel expense? Not reasonable because why would a physiotherapist need to go to Hawaii (unless maybe it was for a conference related to your field of work)? 2. Make sure the expense amount is reasonable. If you are a part-time real estate agent that sells two or three houses per year, its reasonable to expense four or five $200 bottle of champagne (even if you ended up drinking some of those yourself) as a marketing expense. It would not be reasonable to expense 50 bottles worth. Why? Because its reasonable for an agent to give a thank you gift to her clients and buying four or five bottles seems like a reasonable amount (you might want to give awesome clients two bottles for example). But if you only sell about two or three house it might be difficult to make the argument for why you needed so many bottles of champagne that year. This also applies to how much of an expense you allocate to your business. Things like car payments, cell phones, home office expenses etc are reasonable to expense in full only if you use them mostly for your business. But if you sell Arbonne cosmetics on the side and do a couple shows per month, its not reasonable for you to expense 100% of your cell phone bill or your entire internet bill. Look at your bills and try and gauge how much you use for your business. It doesn’t have to be exact (no one is going to throw you into jail if only 8% of your cell phone minutes were used calling customers but you expensed 10% of your cell phone bill). Another good way to determine reasonable allocation is based on the time you spend on your business. If you spend about 20% of your time working on your business (cold calling customers, following up on appointments, administration etc), then expensing everything that would be reasonable to spend on your business at 20% is fair. 3. Keep receipts for everything. In my books, if you don’t have the receipt, don’t claim the expense. If its a major expense (say you bought a new computer) and lost the receipt you can get away with potentially using a credit card statement as evidence (so a $1,500 charge on your credit card from the Apple store might be sufficient) if you are audited, but I would fall back on this as exception rather than a rule. But keep receipts for the small ticket purchases too – people often get caught up in the big ticket items and forget that small legitimate expenses add up. For example, did you take a potential client out for coffee? Buy a thank you gift for that couple that recommended your services? These are legitimate expenses (though remember, food and entertainment can only be claimed at 50%) even if they are only $5 or $10 each. 4. Remember that there is an expectation of profit. Look, the government is aware that most small business owners will expense things that they will use personally and they will turn a blind eye if its reasonable because its not worth their time (or money) to verify, for example, that every cell phone conversation is related to your business and every item purchased at Staples is in your office cupboard. But you, as a small business owner, have to show that its worthwhile for you being in business and that you are making (or are close to making) a profit from your business. Generally, if you don’t start showing a profit after two or three years of business, you will be at much higher risk of being audited and having your expenses declined – even if they are legitimate. Remember a good rule of thumb to follow is one that my dad (a CA and business owner) gave me. It is that you can be a pig – but not a hog. Having a parent stay at home with the kids is a decision that many families will contemplate. One of the main factors in the ultimate decision is often whether or not that family can afford for one parent to stay at home (which I did a post on here). And sometimes, all it takes to make it work is a bit of extra money – whether to pay for essential expenses or just to have for extras. So I thought I’d list out some ideas for jobs that a parent can do while staying at home with their child or children. But before you get too excited, its important to be realistic. These are great ideas to earn a bit of extra money. Unfortunately, none of these are going to make you rich or replace your salary, especially if you were in a professional, post-university level type job. The reality is that if you want to earn that kind of money, you can’t also take care of a child full time at the same time. You just can’t – either your job or your child or (most likely) both will suffer. And anyone or job offer that claims you can make thousands of dollars with little effort, little time and no skills all from home is 100% a scam. Some of the ideas I list below could potentially make you a lot of money, but will require the type of time and focus that an out of the home, full time job demands and you would have to make a choice to get childcare or forgo that potential. However, they are also the type of jobs that you can do on a small scale to make that few hundred dollars a month to give your family budget some breathing room. One job that a stay-at-home mom can easily swing is a MLM (multi-level marketing) type job. This is a job selling a product (make-up, jewellery, supplements etc) to friends, family and later a group of customers directly. Its a growing industry with MLM companies Stella & Dot, Arbonne, Avon, Scentscy and many, many more gaining a lot of prominence and respect. However, while an MLM job can definitely make you some money to add to the family coffers, this is definitely not a job that is right for everyone. I did a post on this, check it out here. If you are crafty, Etsy can be a great way to make some money. The key is to pick a specialty (i.e., if you are a great knitter, instead of having a knitting shop, perhaps concentrate on just one or two things) and focus on being really good at it. I found this great article that goes into more detail on how to make money on Etsy. Pretty much anyone with a decent camera can be a photographer. Obviously, you can’t become a professional photographer overnight and charge $5,000 a shoot, but with the countless courses available both online and at various community centres, blogs and websites, I really think anyone can learn enough “tricks” to be a decent photographer and make some extra money doing family portraits for Christmas or to take pictures at birthday parties. Of all stay-at-home mom jobs, this one has the potential to make the most steady money. The trade off is that you have to be home (so a lot of the SAHM lifestyle that is the reason that many moms/dads want will need to be sacrificed) and you are pretty much working all day caring for other kids as well as your own. However there are ways to have both – I know one mom, for example, who only does before and after school care – her own kids are school aged so she just walks all the kids in her care to school in the morning (she lives just a block away) and picks them up after, but has the school hours to herself. If you love baking/cooking and have a signature dessert or dish, you may want to see if any local cafes or restaurants would like to buy your goods on a regular basis. You could easily prepare the batter or do prep like chopping or measuring of ingredients in the evening after the kids are in be and then preparing early in the morning. A local coffee shop that I frequent hires a university student to makes these amazing salted caramel brownies for them – she makes one large batch everyday and delivers them in the morning when they open. It probably doesn’t pay her tuition but maybe pays for books! Another option would be to have a home bakery business – all you need is a Facebook page – and offer to make goods for special events. Ok, I’ll be honest, this is a very difficult way to make money. So far, I’ve made a whopping $1.54 from Amazon Affiliates sales but this blog costs me $26 a year to maintain so I’m actually in the red (ironically), so its a good thing my only intention with this blog was for me to have a creative outlet and not to make money. However, for those interested, the way bloggers make money is from Amazon affiliate sales (you recommend items that can be bought at Amazon that are linked back to your blog account and you get a commission), advertising revenue (which is dependent on your site traffic) and if you get good enough that people or other sites pay for you to write for them. While its a bit of a long shot, if you are a great writer and have a unique perspective on a popular topic to really make yourself stand out, you may be very successful. While you have a baby you can wear in a sling or carrier, this might be a good option to get some exercise and make a few dollars as well. Depending on the area, you could make a good $50 a day walking dogs. It gets complicated when you have to push a stroller or have a toddler that naps during prime dog walking times, but its something that pretty much anyone can do and can do immediately. This is another area where you can potentially make a lot of money with a small-ish time commitment, however you need to be a subject matter expert or professional whose expertise is in demand. Again, though, any project you take on will likely need several consecutive hours of commitment so you may need to have a sitter or family member who would be willing to help out during those times.